With the popularity of ‘free from’ and veganism showing no signs of diminishing any time soon, healthier snacking has enjoyed another bumper year with growth up 37.5% in value, and according to healthier snacking brand Eat Real, this reflects the choices that consumers are making . Increasingly consumers are influenced by, and understand the benefits of, a free from diet and want to be able to access their snacks of choice anytime, anywhere – at home, at work and at play. The dramatic and recent rise in veganism and flexitarianism means a major new vending market is emerging for those operators prepared to add healthier snacking to their offering. 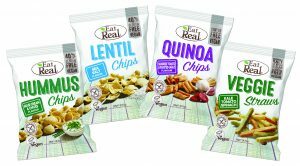 Eat Real’s vending range, which will be showcased at Vendex Midlands (Stand 27), comprises the innovative Hummus Chips, Lentil Chips, Quinoa Chips and Veggie Straws. The Hummus and Lentil Chips contain 40% less fat than traditional potato crisps and the Veggie Straws 30% less, with the Lentil Chips and Veggie Straws containing no added sugar. All are also suitable for Vegan, Kosher and Halal diets, and are 0% VAT rated (UK only). “Being free from all 14 declarable allergens, our snacks are totally safe to dispense with no risk of cross-allergy contamination if they’re then eaten in the workplace or in public spaces. That’s good news for consumers and it means worry-free vending for operators,” comments Simon Roberts, Sales Manager at Eat Real. “As consumers experiment with the ever-growing range of free from products available today, they’re realising that Eat Real delivers big time in terms of taste, texture and health benefits – and this is only going to help drive long term growth in the vending sector,” says Simon.